From Kirkus Reviews: Rebecca Putney, ``Bobbin Girl,'' gazes out from the cover of this exceptional work and draws readers into the fascinating lives of the young women who were part of the unique social and industrial milieu of the mills in 19th-century Lowell, Massachusetts. Rebecca, ten, works at the mill to help her mother's finances. �Exquisite watercolors are perfectly integrated into the text, extending it and amplifying it. �A careful author's note offers background; this is a perfect classroom companion to Katherine Paterson's Lyddie (1991). Some will say McCully (The Pirate Queen, 1995, etc.) has surpassed herself." From Publishers Weekly: "An engrossing, fact-based tale with feminism and fair labor practices at its heart. McCully deftly weaves feminist themes into her spirited text, and her meaty author's note places her story in context. �The courage and ambition these role models inspire in Rebecca are palpable. Rough-edged watercolors, frequently awash in gray light, convey the often oppressive mood of an industrial town of the time." From School Library Journal: "This tale of child labor, early efforts to organize against unfair employers, and human courage is based on the true story of Harriet Hanson Robinson, whose mother ran a mill boardinghouse in 19th-century Lowell, MA.McCully's straightforward narrative is told in the third person with substantial dialogue. " 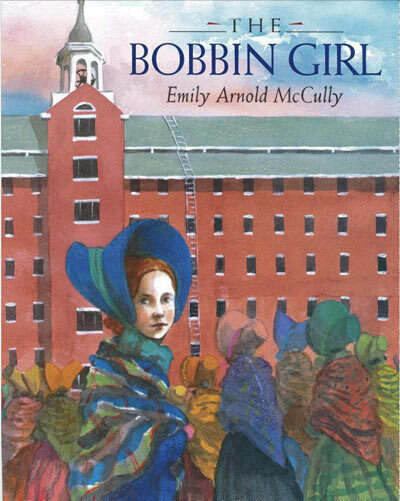 From Booklist: " When her mother's income from the boardinghouse no longer covers their expenses, 10-year-old Rebecca helps out by working as a bobbin girl at the local textile mill.The author's note details the background, incidents, and people who inspired the book. Beautifully composed watercolor paintings give a vivid impression of America in the 1830s and bring the period to life. A useful book for history units."